Summer weather has finally started to rear it’s head around here. That means backyard BBQ’ing and outdoor parties will soon become a reality – especially as we make our way toward my four-year-old’s birthday in early June and my own – GASP – 40th in July! 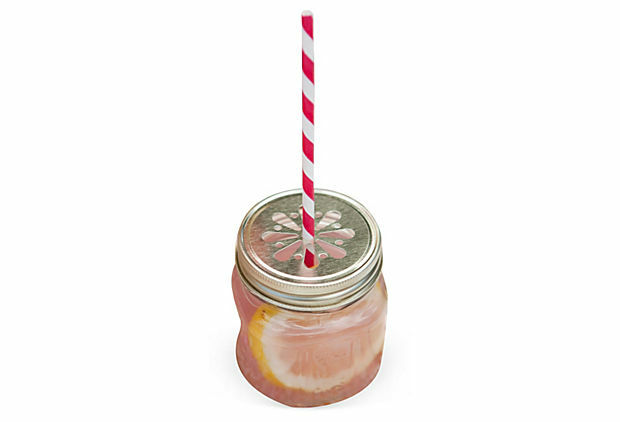 These mini Mason Jar sippers immediately caught my eye and made me long for the lazy days of summer and pink lemonade. I picture a gaggle of sweaty 4-year-olds walking around sipping from cute red and white straws. But who’s to say that these cute little jars wouldn’t make great high ball glasses filled with hard lemonade for the older set? Party in a glass. What’s more fun than that? You don’t even have to clean your house. 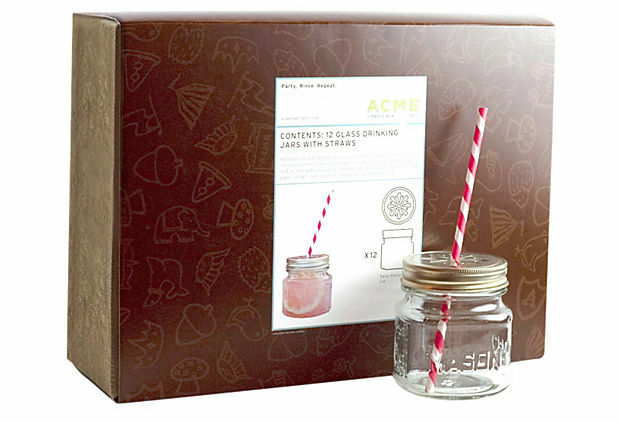 I UH-DORE these amazing little 13.5 oz glasses, which you fill up with your favorite libation… any time after noon. 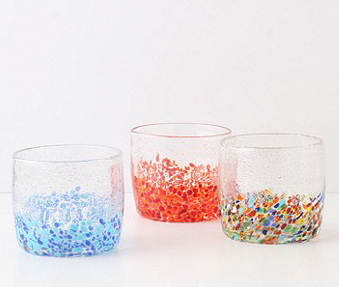 The speckles make way for bubbles, which float to the uppers of my new favorite, and dishwasher-safe I might add, glassware from Anthropologie. Next week, my husband and I will be attending a Kentucky Derby Party. Hats Required. And you know me? There’s nothing I love better than a theme party. 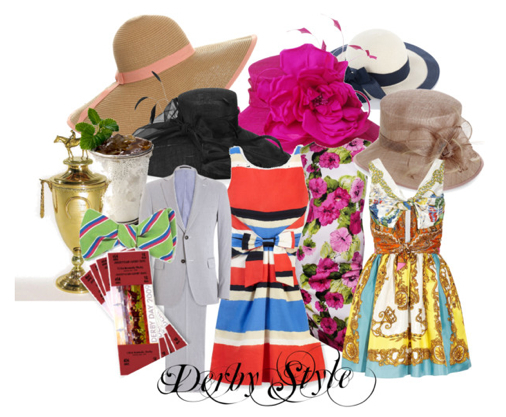 So I’m on the hunt for some Derby-worthy duds to wear while I sip Mint Juleps and cheer on my favorite ponies. Oh! And guys, don’t leave home without your seersucker! The menu item for my post-holiday parties is this gorgeous “starlight” blue satin dress. And I’ll take the embellishments too. After all, why woudn’t I? An elegant mix of sequins and beads against this rich blue satin is my ticket to evening glamour. Prefer it in black instead? You’re in luck! September has rolled around once again and it’s time to start thinking about Jack’s birthday party in early October. We’ve done the Thomas the Train birthday party twice now because Jack’s obsessed with trains. Last year, we did a pizza party with a Halloween theme. It was planned very last minute but came out pretty cute, if I do say so myself! But this year, I wanted to capitalize on the weather this time of year… when it’s fun to be outside in the evening… pumpkin patch style. I’m thinking hay bales and s’mores. White lights strung all around the yard and ghosts hanging from the trees. I’m also picturing a really cute homemade scarecrow… now if I can only come up with a budget for said party… and more importantly stick to that budget! It’s getting harder and harder as our very close friends and their families along with our families leaves us with a 40+ person guest list. Not so good for the budget… but it always turns out to be so fun and what better excuse than your first born, to throw a great party! Hmmmm, I’m going to have to get really creative.